Made from reinforced 100 mm x 100 mm (approx. 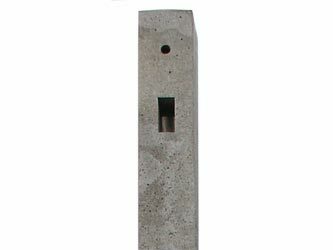 4 in x 4 in) concrete, these are designed to offer greater durability than timber posts. The 8 ft and 9 ft versions have 3 mortice holes while the 6 ft and 7 ft versions have 2 mortice holes. All posts have bolt holes to enable the fitting of Gravel Boards. Timber can also be fitted to the sides of the post to enable the hanging of gates.